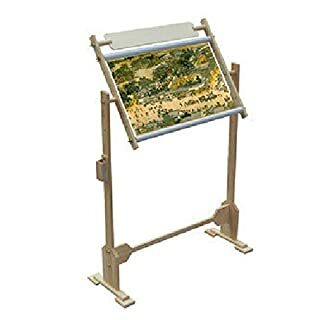 The luxury universal replacement grip for your hands is a swivel 18 "frame for use with free standing PosiLock Tapisserie stand. 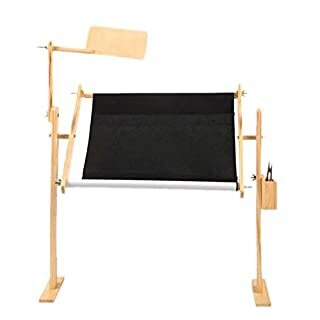 unique designed to allow your work to scroll through but is still attached to your stand. 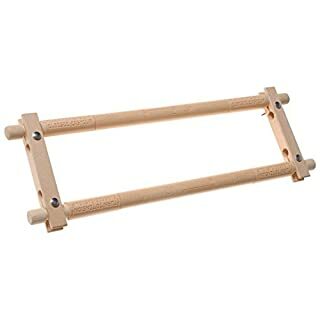 firmly grips Hand frames in all clamp style floor to floor bracket without crushing your fabrics. 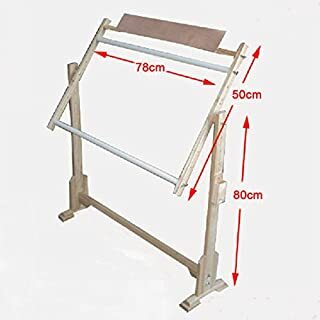 Easy to use, extremely versatile wooden floor stand. The 'Opus' is a completely adjustable wooden floor stand with a wooden clamp which allows you to work in a variety of positions. The Opus allows wider angles and positioning, enabling you to bring your work in close whilst stitching. The stand can be adjusted to your preferred height for working and may be set at different angles. 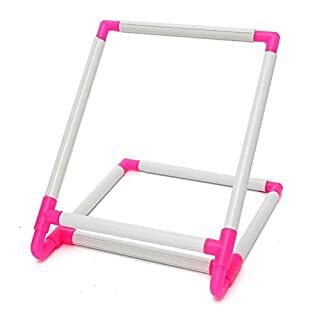 You can use a rectangular frame or hoop up to 24" with the stand. 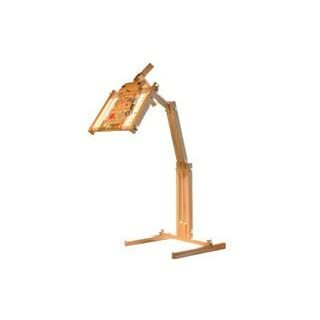 The angle of the frame is fully adjustable to suit your position for working. 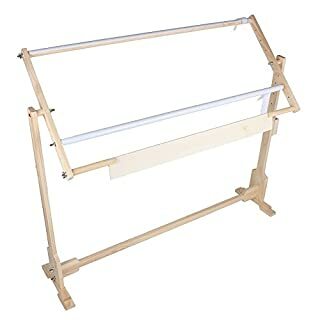 You will have instant access to the back of your work simply by rotating your clamped frame - no need to remove anything, for easy makes fastening off! 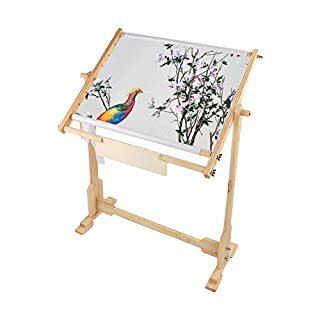 Please note, the embroidery hoop (pictured) is not included. 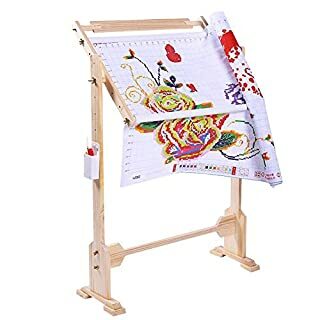 A innovation in rotating frame design, the Easy Clip Rotating Frame makes working your cross stitch and tapestry projects easier then ever before. Simply clip on your fabrics and canvases, no sewing required. Easily position your work by rotating the top and bottom bars together. Lock the frames in place using the wing nuts. We recommend the Twizzler tool to assist in tightening up the wing nuts without hurting your fingers.Simply clip on your required material. Easy to assemble. Unique, self-locking, non slip clips maintain an even tension. Firmly grips light and heavy materials. Change between your projects quickly and easily. 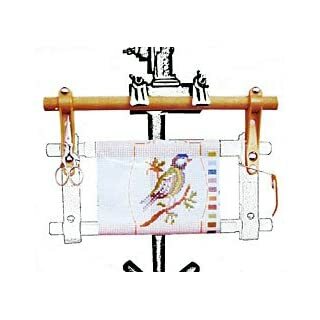 Suitable for Cross Stitch, Tapestry and Embroidery. Helps prevent creasing and marking. Large work can be scrolled. Polished natural wood finish High quality, made in the UK. Top Quality. Made in the UK. 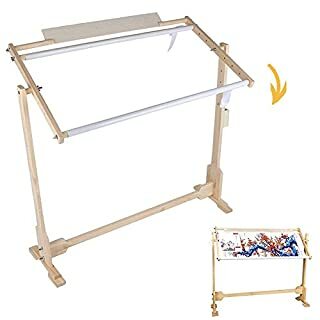 Description: Floor Standing adjustable & portable cross stitch frame Wooden Pine floor standing tapestry Cross stitch frame - 3 Sizes. 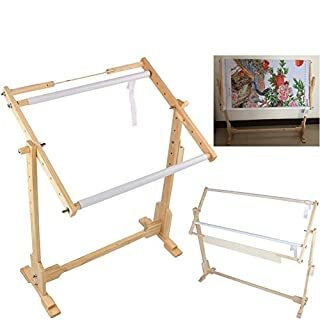 The Cross Stitch Frames under the perpendicular circumstances: 9CT Length 50cm (the highest position is 68cm and lowest position is 41cm） 14CT Length 80cm (the highest position is 79cm and lowest position is 52cm） 32CT Length 100cm (the highest position is 79cm and lowest position is 52cm） The 3 sizes of the cross stitch frame width is 47cm. 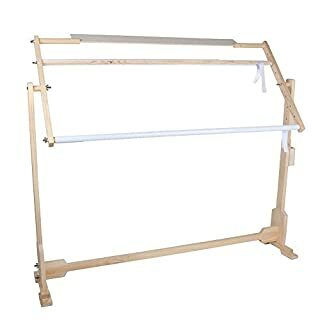 The frame has five foot positions for increased stability. The top frame can be used as a hand frame or attached to the leg in 5 positions giving height flexibility for maximum comfort. Product features:1. 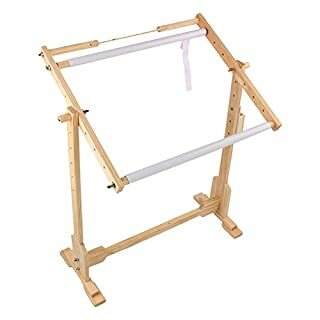 The Cross Stitch Rack have 5 adjustable height. easy assembly; no special tools are required.2. 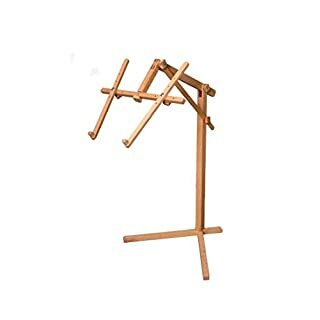 Made of Solid wood, hard and natural smooth texture, good wearability, lightweight, thus easy to carry and use.3. 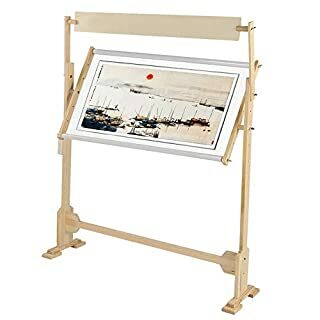 Height: about 80cm/31.5 in; Size of embroidery frame: about 51*40cm / 20*15.7 in.4.360° rotating with easy access to back side for finishing.5. Versatile adjustability allows frame to be used either on a table or sitting comfortably on the couch or other unsteady surfaces.